The farm Bauerngärten operates self-service gardens in three different locations. One of these locations is the natural reserve area in Berlin-Spandau, south of Gatow. The founder Max von Grafenstein, who is a professional farmer, brought this idea with him from his place of study in Kassel/Witzenhausen. The extremely successful project introduced the principle of rentable gardens Mietgärten seven years ago. There are 1000 participants in the project who rent out small plots from 45 to 70 square meters from the farm. They only have to chop and harvest their vegetables, while the workers in the Bauerngärten take care of the rest. 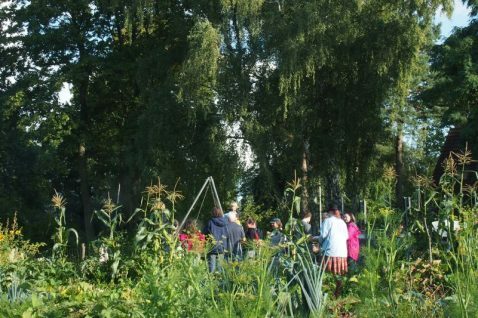 For this service along with the rental of the garden plots, they only have to pay 300 euros, almost the same amount they would pay for organic vegetables found in supermarkets. Here, however, they can also learn about growing organic vegetables through workshops offered by the farmers. The company is certified as an organic vegetable farm and is a member of Bioland. The founder, Max von Grafenstein is also still active in the Nyeleni Movement for the right to food sovereignty. Wednesday September 13, 9:00-14:00, Exkursion 6.